The cartons you want, when you want them. How much time should pass between (A) your customer placing an order and (B) the carton being ready for shipment? Our answer: minutes. At the most. We realized this was the goal for many of our customers. So we partnered with LasX to devise a solution. The result: our CartonsinMinutes ® system for on-demand processing of highly customized short orders. 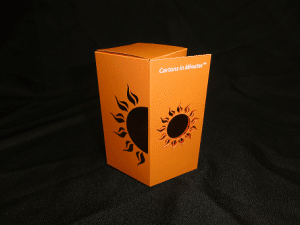 CartonsinMinutes is a purely digital process that combines digital workflow technologies with laser converting, robotic automation, and flexible folder-gluers. With it, your customers can place orders that automatically ping the production floor, producing precisely the folding cartons (or other folded / glued product) they need with zero waste — even if it’s a very small order for nobody else but them. It is an innovative, cost-effective solution to the very problem that businesses like yours have been facing in our current digital economy. In the folding carton & print finishing industries, lower-volume orders with shorter lead times is the new trend. So many of our machines at Kluge are designed to produce large quantities of high-quality products with minimum make-ready time. But we also recognized the need for on-demand, order-of-one processing. In today’s economy, every business in the folding carton and print finishing world must be able to accommodate highly personalized short orders. Of course, it has always been possible to make an on-demand, low-volume order for just one customer. The trick was to do that without incurring additional costs, wasting time, or wasting materials. Using conventional folder gluers and print finishing machines, making a small order for one person necessarily meant putting precious resources to waste. Even if you replaced the individual parts with something automated (a digital printer, for example), as long as there was an analog flow of information between the various components, the workflow would always be inefficient (to say nothing of the time required for machine setup and queuing). The best solution — indeed, as of 2019, the only solution — was true digital manufacturing. By that, we mean one continuous process that turns raw materials into finished goods in a single process that takes only minutes. -No rotary die setup or storing. -No WIP or finished goods inventory. -Not an analog process in sight. In essence, we needed to make cartons in minutes. So we made CartonsInMinutes ®. It’s a state-of-the-art workflow made possible by our co-marketing partnership with the great minds at LasX Industries, Inc. The CartonsInMinutes ® system seamlessly connects your customer to your manufacturing floor so the flow of a product order never goes dormant. Materials move fluidly from one process to the next — printing, cutting, scoring, and handling. When the order is done and out the door, the next one can start right away. The CartonsInMinutes ® system offers instant changeover between jobs. Idle work in progress (WIP) inventory is a thing of the past. Because our system is entirely digital, the product itself begins as a layered PDF — digital artwork — consisting of complex information and digital commands that the manufacturing system understands with a high degree of specificity. Live orders are prioritized and processed on the fly. 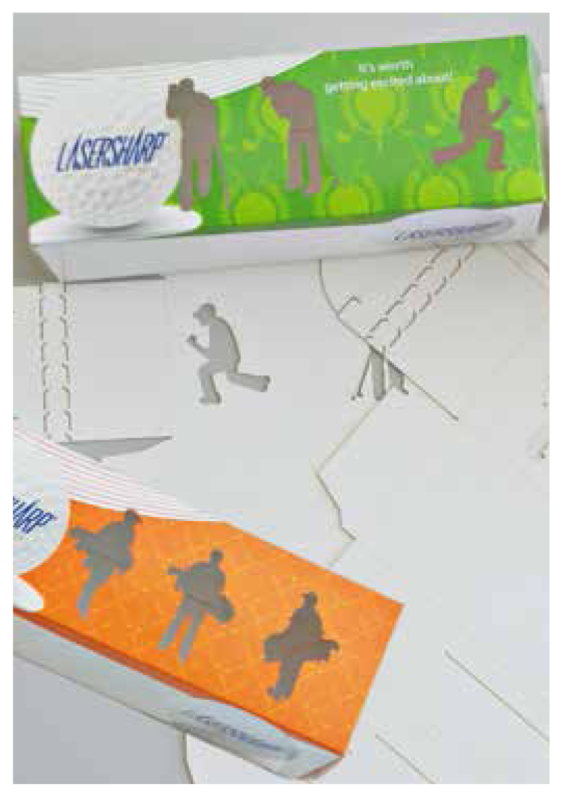 -The cartonboard gets cut, scored, perforated, and/or punched. -The materials get sorted and stacked as needed, and then sent into the folder gluer/stacker. The automation doesn’t end there. Once the material is processed, pick-and-place robots positioned at the end of the laser processing module identify each piece, and then they automatically stack, sort, rotate, and/or shingle the product as needed. You can further automate the process so that finished pieces are automatically sent in for additional finishing processes and then packaged. Multiple conveyor belts can be used after laser processing to send different products to the appropriate stations. There is minimal tool wear. Alterations are easy and can be made directly on the manufacturing floor. Once upon a time, your workers’ hands were required to create, set up, and store metal dies — a process that was anything but quick. With CartonsInMinutes ®, those dies are replaced by vector files, which command the lasers’ path in less than the blink of an eye. Your customers can now place orders with the confidence of knowing they’re ready to ship soon after — even if the shape is complex, nested, or variable. 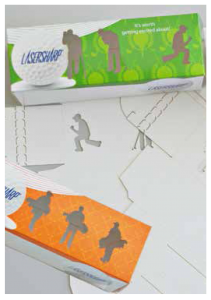 CartonsInMinutes ® combines our longstanding and industry-leading brand with another leader, integrating LasX laser processing technology with Kluge finishing equipment. It represents a powerful, 21st century jolt to your business’ bottom line. To learn more about CartonsInMinutes ®, or to get a quote for your company, simply call 866-501-7741 (toll free: 800-826-7320, U.S. or Canada) or contact us online.